Kidderminster Harriers have boosted their hopes of escaping the drop from the National League by bringing Keith Lowe back to Aggborough. The 30-year-old Wolverhampton-born defender has rejoined the National League's bottom club on a contract until the end of the season. 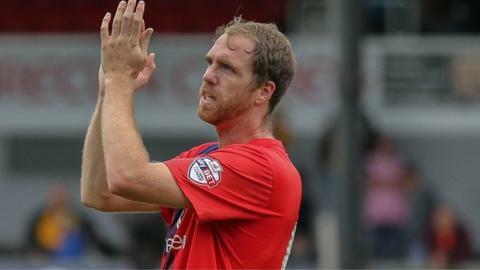 Lowe was a free agent after being released by League Two strugglers York City on 9 December. "Being bottom of the league doesn't scare me at all," he said. "For me, the season starts now. I am not worried about what's happened in the first half. We have to concentrate on this second half, start picking up points and see where we can get." Lowe first joined the Harriers from his hometown club Wolves in August 2008. He scored three goals in 52 appearances before leaving to join Hereford United, followed by a move to Cheltenham Town, where he was reunited with former Harriers boss Mark Yates. After four seasons there, he joined York from Cheltenham in January 2014 after an initial loan spell. Harriers sit bottom of the National League, 13 points adrift of safety, with 20 games of the season left. Because of successive postponements, they have not played since 28 December. During that time head coach Dave Hockaday has departed and the team is now in the hands of chief executive Colin Gordon.